"You can go to a grammar school and never see the light of day again for the rest of your life. The moment you pass you 11-plus exams, it could be all finished for you. I'm afraid it upset my parents a bit when I got in with this musician crew, and the cleft between mum and dad and me got gradually wider." "So at sixteen I left home and I started my real education musically--moving from group to group, furthering my knowledge of the blues and other music which had weight and was worth listening to." After leaving home, Plant joined the Crawling King Snakes. "The group was into a bit more of a commercial sound than the other bands I'd played with. I'd be hopping around the stage with the mike stand in the air. A lot of incredible things happened to us and I met a lot of people who made sure that I'd carry on in the way I was going." "I used to seek out tales about him. For example, he always liked to eat some rabbit after a gig. One time in a Birmingham hotel, the only thing he could find in which to cook up his rabbit was a coffee percolator. So he put it in, turned it on and promptly fell asleep. The rabbit cooked and cooked and cooked. In the end, they had to evacuate the entire floor of the hotel and Sonny Boy was asleep, still snoring away. He had this strange charm about him though. He'd have a really good time yet he was really coarse--he was everything I wanted to be at the age of 70." After appearing with several different groups in the early 60s Plant formed the Band of Joy, a group with a wide variety of influences which was to serve as a vehicle for Plant's vocal experimentation. Unfortunately, conflicts with management caused Plant to be fired. He formed a second Band of Joy which had similar problems and so had to create a third. The third included drummer John Bonham who Plant took an immediate liking to. This Band of Joy lasted over two years and released three singles, after which Bonham went on tour with Tim Rose and Plant continued his previous dabbling in multiple bands. Plant's confusion over his musical direction continued until 1968 when he ran into Jimmy Page who was forming a new band . . .
His father, a civil engineer, duly arranged for his only son to attend grammar school near Birmingham. "It was decided by my teachers that I was intelligent but unwilling to concentrate," said Robert. "I do remember being a kid in short pants at Christmas time looking into the mirror and singing "Hound Dog". "At thirteen, I liked girls all of a sudden and it all came down to attracting them the best way I could. So I grew my hair. It flopped down over my ears and was immediately chopped off by demand. I forgot about lessons for the next few years and kept joining pop groups." "There was this fellow called Perry Foster who lived near Kidderminster, my home village. Perry was an incredible eight-string guitarist, and instead of playing it in the normal way, he used to play like Big Joe Williams with the instrument half on his lap. He was a horrible bloke at times but he was a real white bluesman, and when I was fifteen I fell immediately under his spell. I suppose he was the one who really introduced me to this music. "My dad used to drop me off at the Seven Stars Blues Club in Stourbridge and we used to wail away on "Got My Mojo Working" and stuff like that. Chris Wood used to play with us, and Stan Webb and Andy Sylvester were in a competing band." Wood later joined Steve Winwood's Traffic and Webb helped form Chicken Shack, a highly regarded late-1960s British blues band. "The Seven Stars Blues Club was really my initiation; our group was called the Delta Blues Band. When we weren't doing that number, a guitarist and myself would go around the local folk clubs playing "Corinna Corinna". The first music which really appealed to me--even when I was still at school--was stuff like Bob Dylan's "Corinna Corinna". When you look deeper into that kind of music, you find that it has a lot of the feelings that exist in blues. Then, of course, you realise that the blues field is a very wide one." 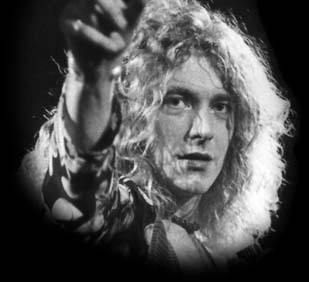 Like most young rock musicians, Robert Plant ultimately stumbled into a crossroads in his blooming career path. "It was really hard to combine school and the clubs and keep a compatible relationship with schoolmasters and parents, at the same time as getting into what I really wanted to do. At the time, I thought the combination was great. Apart from being able to have a drink under age, it gave me a break into a different society with different values.